11 N. Pearl wedding..The getting ready time that I photograph on a wedding day can produce photographs that go beyond the many different variations that you've seen on the make-up pictures or the detail photos. This is a time a day where the camaraderie shows between friends and family, the relationships you have with these people you've gathered around you become clear. 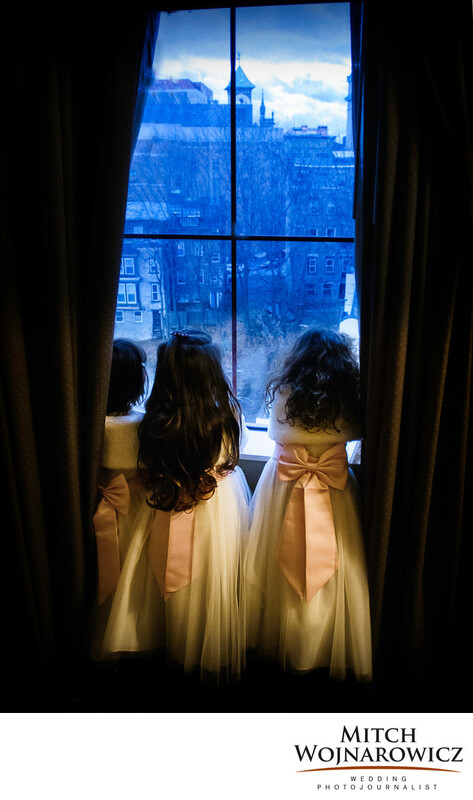 And often, Little moments such as three flower girls looking out of the window of a familiar chain hotel can create a timeless image that feels like it was taken in another country...If you allow extra time in the schedule for your 11 North Pearl wedding, your photographer will be able to step away from the schedule of the day and will be able to look for these little meaningful moments that you'll treasure...This is not the sort of image that you can make up or put on the schedule or have on a checklist. This is the sort of image that happens all by itself and a sensitive, engaged photographer who has a little bit of freedom in terms of time we'll be able to capture it for you. Working as a documentary wedding photographer in Albany New York, and my years of working as a wedding photojournalist have given me the ability to see these quiet little moments even in the busiest times of the wedding day...If you're planning an Albany wedding look no further for the best Albany wedding photographer and give me a call today. I'll be glad to talk with you about how my unique approach to photographing weddings can give you a collection of photographs that will be meaningful to you days and years after the wedding is over...Let's become a team for your wedding at 11 N. Pearl or 90 state events, or any of the Albany country clubs, Churches, Synagogues or other popular venues for a wedding in Albany..